Chawanmushi, or Japanese steamed egg custard, has made an appearance on fivetwentysix before. The format is highly adaptable to whatever protein or seasonal vegetables you want to fill it with. For this variation I used dungeness crab meat, and made a dashi infused with green garlic and the crab shells. Cooking with all parts of the animal makes me incredibly happy; crab (and lobster) shells are excellent ingredients, not to be wasted. The steamed custards are topped with a few spoonfuls of ponzu, a classic citrus & soy based sauce. This version is heavily inspired by Kyle Connaughton's (of Single Thread Restaurant) version appearing in Modernist Cuisine. It will benefit from up to a month of infusing in the refrigerator and is powerfully laden with umami. The garnish for the dish is a few slices of very thinly shaved radish, as much for textural contrast as for flavor. For 4 servings (yields extra chawanmushi base). Prepare the ponzu sauce (up to 1mo in advance): Reduce the sake and mirin to about 70g. Toast the kombu over an open flame. Vacuum pack all ingredients together. Reserve in the refrigerator until needed - the sauce should keep for at least 1 month if not longer. Strain before serving. Prepare the crab dashi (up to 8h in advance): Combine the kombu and water in a pot and simmer for 30m. Strain. Gently saute the green garlic and crab shells in the pot with a small amount of oil for ~3m. Add back the dashi base and simmer on low for 30m (do not boil). Strain. Add the katsuobushi, bring to a boil, remove from the heat and cool. Strain. Chill until needed. Prepare the chawanmushi (up to 8h in advance): Beat the eggs lightly, then whisk in the remaining ingredients. Strain. Chill until needed. To serve: Slice the radishes very thinly on a mandoline and reserve in ice water to crisp until needed. Place crab meat into serving bowls and pour in some of the egg mixture. Wrap plastic wrap tightly over the top of each bowl. Steam for 15m, or until set. Remove and cool for several minutes. Drain the radishes on paper towels. 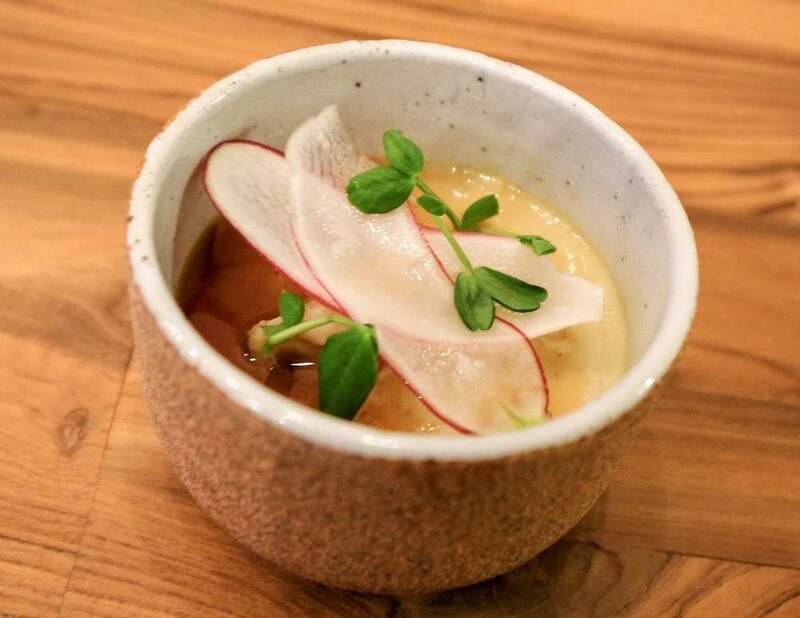 Dress each chawanmushi with a spoonful or two of the ponzu sauce, then garnish with a few radish slices and some of the greens.